There are an unprecedented number of new hotel projects opening in New York City. And operators are exploring news ways to lower prices — and raise them. Two major trends have emerged among these new hotel offerings, according to Bloomberg. Firstly, a slowing market has encouraged residential developers to work with luxury hotel brands. For hotels, the sale of expensive condos in the building can offset development costs. 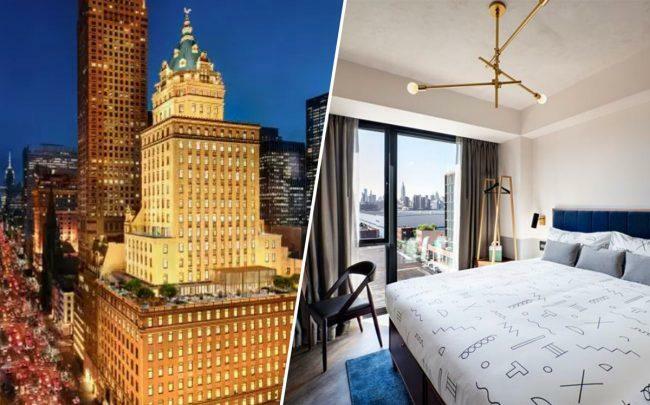 That’s the case at the Crown Building at 730 5th Avenue, where luxury hotel company Aman Resorts is making its New York debut with 83 hotel rooms and 20 condominiums. An Aman-branded penthouse in the building went into contract for $180 million last year, The Real Deal previously reported. The cheapest rooms at the Aman hotel are expected to go for around $2,000 a night, according to Bloomberg. Vlad Doronin is developing the residential component of the historic property. Secondly, more operators are exploring “micro-hotels,” with small, cheaper rooms but larger common spaces.